Imagine watching an animated film that is crafted so brilliantly that you can feel every horrific nightmare and trauma associated with a war to the bone. Waltz with Bashir, is one such film that takes you deep inside the mind of a teenage Israeli soldier who had barely begun to shave. If you fancy animated features, take a break from the seven dwarfs and the little mermaid and tune in to learn history the animated way. Strap up, sit back and pretend you’re an Israeli soldier ready to take on the enemy, except you don’t know the why, how and when. 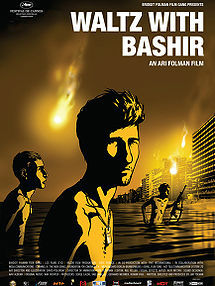 The 1982 Lebanon War through the eyes of Ari Forman; an Israeli veteran, here’s presenting Waltz with Bashir. Written and directed by Ari Folman, the film is Folman’s autobiography, where he narrates his journey back in time to recollect memories from the 1982 massacre by interviewing the soldiers who had served alongside him during the war. Waltz with Bashir frames war as a meaningless exercise that holds no real relevance to its perpetrators, including Folman. Folman’s amnesia shows an interesting depiction of how injustice and violence during wartime is so easily forgotten and accepted.